Since we are about to go into a rough weather period, I decided to post this early. If you didn't see yesterday's post - go here first. 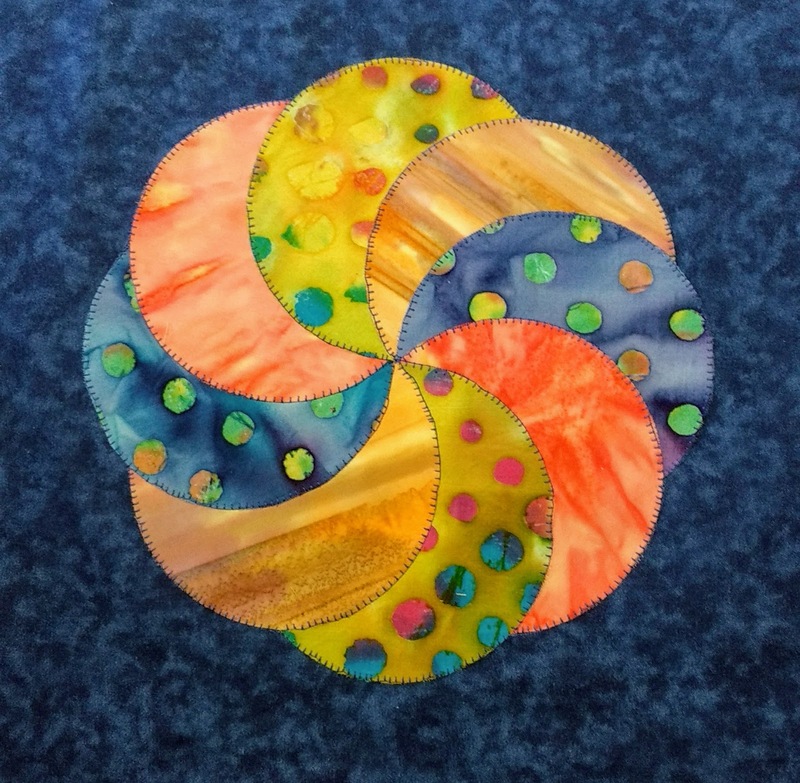 I made a decision and sewed the hummingbird into the circle. But first I made this swirl and tried it there. 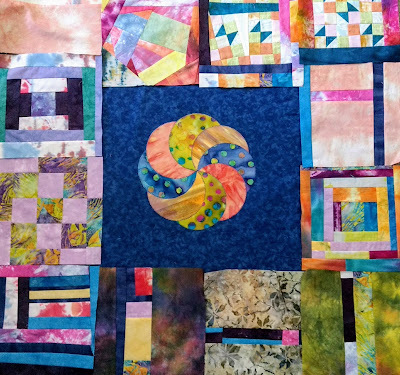 I love the swirl and I tried several background fabrics for it, but it just didn't work well with the other. Perhaps solids would have worked or maybe another color combination - Who know? maybe I will try again with different fabrics for the outer circle and see what happens. So now I have the swirl -and I love it- but where will it go? It spoke to me or maybe the muse did and said "The crazy pieced blocks you made for Pineapple surprise -try those!" So I did. I did a very quick (inaccurately spaced) layout and I think I may just love it. It would need more blocks added and some spacer strips to make it fit, and a better arrangement of the blocks maybe - but oh yes, it works. I am thinking that as I enlarge it, some inner borders/sashing of sections -not each block- would provide calm areas for the eye to rest. This is at least one possibility. (((grin))) We shall see what happens. Dearest Irma is headed up into Alabama and is supposed to be at tropical storm level when she gets to my area. Tropical Storm – wind speed between 39 MPH and 73 MPH I am very familiar with tracking hurricanes as before I retired I worked emergency preparedness with Public Health. The National Hurricane Center website is one that I have watched a good bit the last few days. Right now we only have rain and some gusty winds - not nearly what we will have by tomorrow morning when the bulk of Irma arrives. For those of you in the area - stay safe. The rest of you please send warm thoughts, prayers etc. to all in the path of this storm. I hope your winds and rain aren't as bad as predicted. Praying that Irma doesn't do much damage in your area!! Making a swirl? One can only hope to do that, looks complicated. I love it. Swirls were appropriate for our weather. Would you believe we evacuated to Alabama?